Implementing iPads in our program has been a long process. Using new technology in education always creates more questions than answers it seems. How will they be stored? Who will take care of the maintenance of updating the software and loading on apps? Should we just have it as a teacher tool or student? What apps will suit our needs? After six months the majority of the questions were answered, resolved, and set in place. Initially, it was a challenge to implement iPads in the school. Most teachers were already in the process of integrating the netbooks into their program; so the thought of using a tablet was not a priority. Some teachers were quite familiar with tablets and some had hardly used them at all. Quite naturally, there were some who wondered if they would have enough time to learn to use another new technology. One of our first steps to alleviate these feelings and hesitations were to get the iPads into the hands of the teachers. We encouraged the teachers to sign them out and just “play” with them. This allowed teachers to become more familiar and comfortable with the iPad, and within a short period of time, they were beginning to ask their own questions about potential pedagogical uses. The initial use was just for research purposes through our available databases–something that was already familiar to teachers and students. Within a short period of time, the teachers began using the camera in the iPad to capture student work; video was used to record science experiments and dramatic performances. The use of apps, such as Explain Everything, Book Creator, Toontastic, and Google Translate, expanded potential learning outcomes in literacy programs. Students were now creating diverse and interactive media texts (these texts had traditionally been completed using a pencil and paper). Student engagement increased, especially for those who found it difficult to maintain interest in certain subjects. Students became leaders when using this technology. 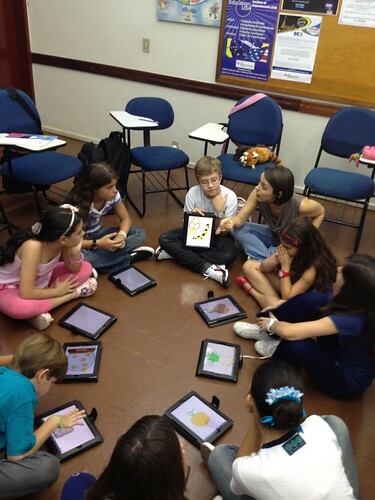 Teachers saw, firsthand, how easy it was for students to create, collaborate and communicate with the iPad. The use of iPads was having a tremendously positive impact on their programs and, more importantly, their students. Within two months, we progressed from the technology being used by only a few individuals to not having enough technology in the school to meet the demand. There will always be issues and questions with new educational technologies but, as long as teachers continue to experiment and have a clear educational goals in mind, your iPad program will grow in a positive way. Decide on a strategy for introducing the technology to teachers (i.e., will iPads be used as a teacher tool to collect data – 1 per teacher, or as student learning/creating tool – a bank of 10-12?). This will help determine how many to purchase and where/how to store the iPads. Our school currently has a set of 12 iPads that can be signed out to use with a class (using the ratio of 1 iPad per 2 students) which has been very effective for grades 3-5. This set of iPads can be signed out using a central, online booking system so that all teachers can locate the iPads and book them with ease from any location using any device. Teachers in K-2 are using them as a teaching tool to collect student assessment data. Grade level teams are also working together to develop ways to use apps to collect student data. It’s important to label the iPads so that students and/or teachers can go back to the same iPad if they are saving work. We found that the easiest way to do this was to use a permanent marker to label the charger cord and the interior of the iPad cover (easier to see if it’s not black). Another idea is to use a stick-on label from a label maker. We store all the charging cords in a mobile netbook cart. This means that the iPads have to be returned daily in order to the charged. This cart is stored in a central place in the school. Keys to the cart are controlled by teacher volunteers who have chosen to plan/lead/support technology integration in the school. One person on staff is responsible for loading and managing all apps on the iPads. One strategy for implementing the effective use of iPads was to introduce staff to 3-4 highly versatile apps (see above) and then allow time to learn and become comfortable with their application for teaching/creating. Schedule regular lunch and learns (once a month) to introduce new apps and discuss issues around their use, storing/sharing information. Sometimes, educational technology resource teacher personnel were present to demonstrate, suggest ideas, or make recommendations. Develop a team of student ambassadors who can assist teachers with carrying the iPads to classrooms and then returning them to the cart and plugging them in properly so that they will charge. Purchase iPad cases appropriate for age level to protect the devices from damage; cases that provide adequate protection for daily classroom use are currently not available through Apple; do some research to find a case from a manufacturer that fits your needs.